When I am looking for literature study guides for my high school daughter, one of the first places I start is always Progeny Press. We love that guides for individual novels or plays can be selected without purchasing an entire year-long curriculum for a single novel. This applies to Shakespeare's plays as well, since I have a very particular list of works we will be studying. Thankfully, Progeny Press has me covered with their Macbeth E-Guide. Progeny Press provides literature study guides for students in the earliest elementary grades through high school. All guides from Progeny Press teach literature from a Christian perspective, while encouraging children to think clearly and enjoy learning. You can read more about Progeny Press' mission and their statement of faith at their website. However, I find it comforting to know that all instruction and conclusions drawn in these study guides will support and encourage our Christian faith. 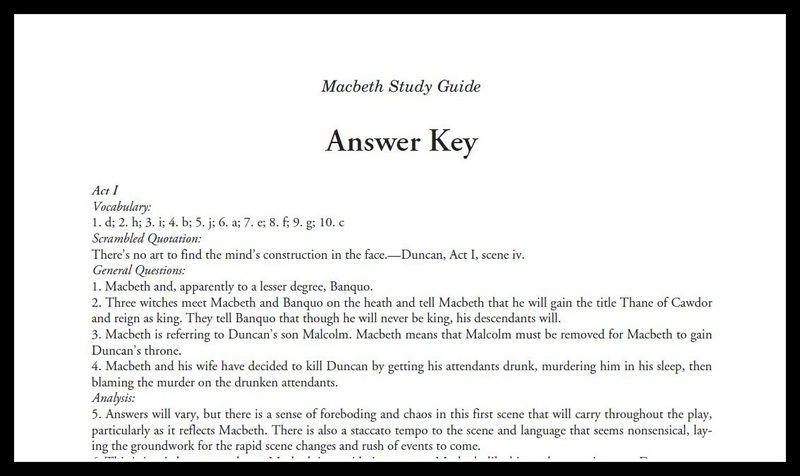 We received a digital copy of the high school level (9th-12th grades) Macbeth Study E-Guide and answer key as two separate PDF files. Can I just say how helpful it is when the answer key / teacher's guide is separate from the student's study guide? Although I trust my student, most days, to not peek at the answers, this removes all temptation. The interactive Study Guide actually begins with a note to the instructor on ways to utilize the study guide and even a suggestion on how to credit the course. Then instead of jumping right into the study of Macbeth, the guide lays a foundation that ensures the student will have an understanding of the play. First a note on Shakespeare's plays to introduce the style, which is especially useful for first time readers of Shakespeare. Next a synopsis of the play in modern English. This is an invaluable portion of the study guide, since it ensures the student starts with a solid understanding of the plot. and can then focus on other aspects during the study rather than attempting to discern the basic plot. Then background information on the time period and the author himself, all of which are crucial to a full understanding of the play. Lastly, pre-reading activities that are not required, but may enhance the experience. The study guide portions are interactive, meaning your student can use them on a computer or other device (including an iPad) and answer directly in the PDF document. Matching vocabulary terms have drop down lists, vocabulary words can be typed with their synonyms, and questions have answer boxes to type complete sentences. For students who struggle with writing, this is a thoughtful solution that requires no extra work on the part of the parent. For students who struggle with computer usage, the PDF file can still be printed and the student may then write out their answers. As you would expect, the study guide is divided by acts of the play and includes a wide array of questions and activities to ensure comprehension and encourage deeper thought. Given the language used in Shakespeare, vocabulary work is an obvious choice of activity to include in every act. Even still, the type of vocabulary work varies by act to keep the student from becoming bored and to assist all types of learners. There are also a few general questions to double check that the student is following along with some of the details in the play that are not given in the summary. Then the questions turn to analysis, asking the student to consider a specific scene or quote before commenting on its importance or how it reveals additional information that is not obviously stated. Students are also given character study questions and asked to talk about various literary devices used. To further the reader's understanding, Dig Deeper questions direct the student to think about specific instances in the play and consider how we should respond in those situation. 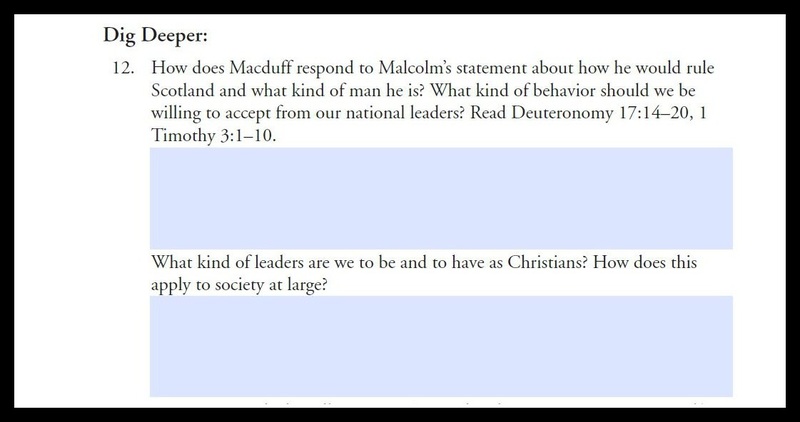 Specific Bible verses are listed for reference to many of the Dig Deeper questions. Finally, each act ends with discussion questions to be done with the teacher and any other students, as well as extra writing activities of a more creative nature while still being based on Macbeth. The guide ends with a list of additional resources to enhance the Shakespeare experience. Personally, I appreciate the listing of videos, since we like to watch a production of each Shakespeare play at the conclusion of our study. This is a no-nonsense answer key organized by act, just like the study guide. It provides strictly the answers to each question, or some possible answers when the student's opinion is requested. Normally I like for answer keys to reprint the question, but in this case with the interactive study guide it is appropriate for the answer key to skip reprinting the questions. Honestly, I think it might be easiest to print the answer key instead of flipping between windows on a computer or other electronic device when grading. Amber and I have used other Progeny Press high school level literature study guides and feel this Macbeth E-Guide meets and even exceeds the rigor we expected from Progeny Press. 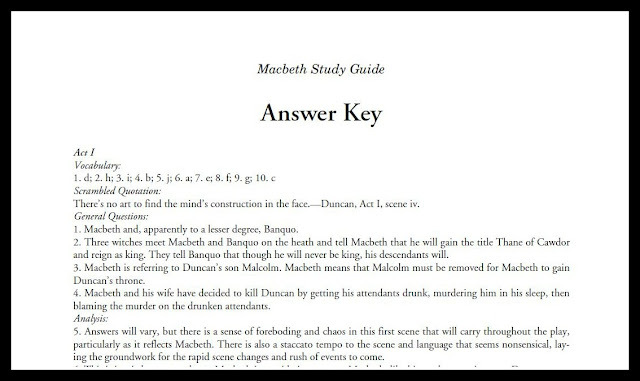 Previous guides also included a mixture of vocabulary, comprehension questions, and analysis very similar to those used in the Macbeth E-Guide. We have always felt the Progeny Press guides provide a good balance in the type and difficulty of the work expected, while being flexible enough for many types of learners. 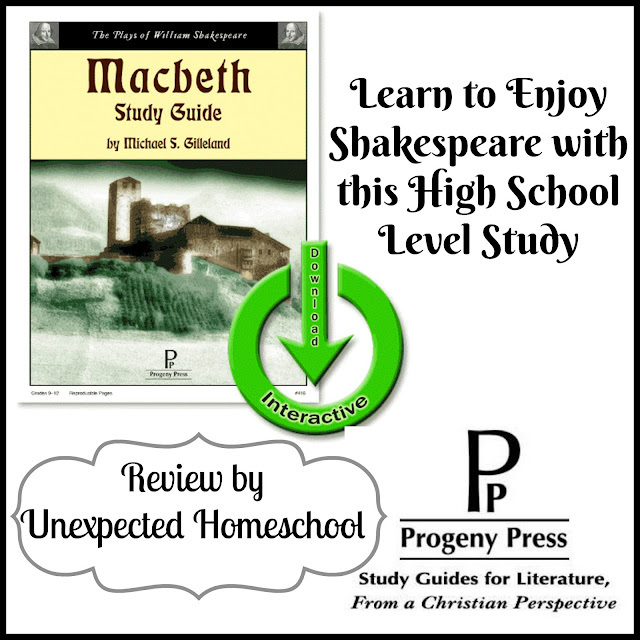 Amber and I both agree that Progeny Press has truly made Shakespeare accessible for the average teenager with this Macbeth E-Guide. It provides enough information and support to help the student through the difficult language, while still asking pertinent questions that direct the reader to the main themes of the play. We appreciate that Progeny Press makes it so easy to enjoy quality literature. Please follow the link in the graphic below to read their thoughts.